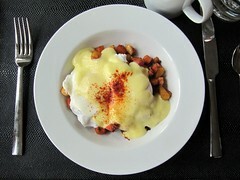 If you enjoy poached eggs but have never made one, try. The first few may not be perfect, but after a bit of practice, you’ll be ready to host a top-notch brunch (maybe for mother’s day?) Speaking of mothers, mine can poach eggs very well. I’m sure I called her a few times trying to remember her tricks – but now I’m confident enough to make 6-8 at a time. After coffee. L: Winter vegetables (romanesco cauliflower, napa cabbage, carrots, garlic, chili) in a lightly seasoned broth, topped with a poached egg. 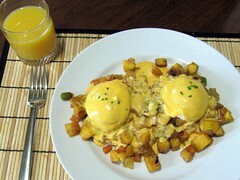 Inspired by a breakfast at Nick’s on Broadway, a great place for egg-spiration. There are step-by-step instructions for egg poaching on Simply Recipes. My method is similar. I don’t time my eggs, instead testing the egg with a very timid poke, and I err on the early side when removing the eggs, especially if they are headed for a warmed dish in the oven. I use a large skimmer from Ikea to remove each egg and gently shake off excess water. 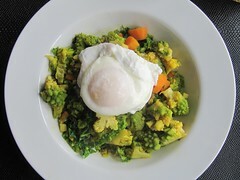 Don’t forget that poached eggs can be great for dinner as well: on a hearty salad, bean stew, warm lentil salad… How do you like yours? 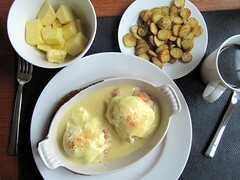 I love poached eggs in Italian soups, but given the choice I’d have to go with your Smoked Salmon Eggs Benedict. That looks DIVINE. I must look for the Sriracha Hollandaise recipe. It’s especially awesome because we caught, and my parents smoked, the salmon! If I remember correctly, the Sriracha hollandaise was just one of the hollandaise recipes from Joy of Cooking with some added sriracha.